This TpT Bundle may contain a variety of file types. Please read through the product description of both the bundle and the individual resources to make sure that you have an application to open the included files. TEACH your students to DECODE MULTISYLLABIC WORDS. "I CAN READ GIGANTIC WORDS!" is a program designed to give your struggling readers decoding independence. In this program, your students will use their personal white board to help them see the small words and word parts (affixes) they already know! inside larger, more daunting words. Many struggling decoders find making sense of complex rules confusing. This method simplifies their task, and brings increased confidence and pride to the process. The concept is simple: teach readers to recognize and read word parts and small words with automaticity. Teach them to spot these word parts and small words inside gigantic words. To this end, the program teaches 144 word parts (affixes) in the same ways beginning sight words are taught. Using FLASHCARDS (large teacher-sized, personal-sized and digital) the parts are introduced and then practiced. REFERENCE and MANAGEMENT RESOURCES are included. A SPELLING COMPONENT is included. Students learn to spell the 144 word parts, which they can use to spell hundreds of multisyllabic words. The ASSESSMENT COMPONENT focuses on tracking the word parts readers can readily recognize. •Will benefit from systematic decoding support. •Struggle to recognize parts inside multisyllabic words. •This program is most useful for readers of any age who have achieved approximately second grade reading level or above. Most useful for struggling decoders in grades 3, 4 and above (grades 3-12 and adults). 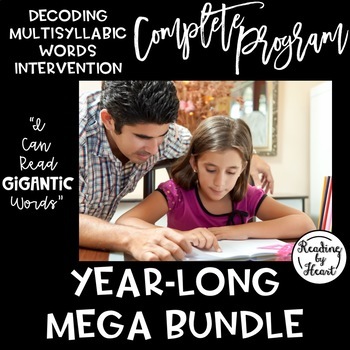 •This program is also valuable for many on-grade-level readers in 4th grade, as they begin to encounter many multisyllabic words in their reading.